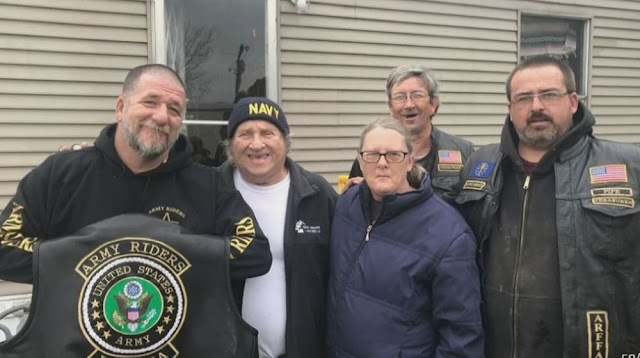 South Bend, IN (December 31, 2018) — A local veteran is warm and safe inside his Hamlet trailer this holiday thanks to a dedicated group of Army veterans. The Army Riders, a non-profit motorcycle group, aims to serve those who served. They help veterans in need. Now, one of those veterans is saying thanks. Tom Tharp knew the trailer needed work when he bought it, but he didn't expect it would be this bad. “They came in stepped up and said what do you need done? We will do it,” says Debbie. The Army Riders are a group of veterans who are dedicated to helping other veterans. “It doesn’t matter what branch they are in – it doesn’t have to be army – we help every branch if they area vet and need help we want to help them,” says Brandon “Gunn” Smith, the president of the Army Riders of Indiana. Smith, or Gunn, has he likes to be called, served in Afghanistan. Now he is serving others through the Army Riders. Gunn is a welder and he combines his talents with the others in the group. Jeremy “Pipe” Gadsby was military police. Now he is a plumber. “This is a family --every one of them. These guys will do anything for anybody. 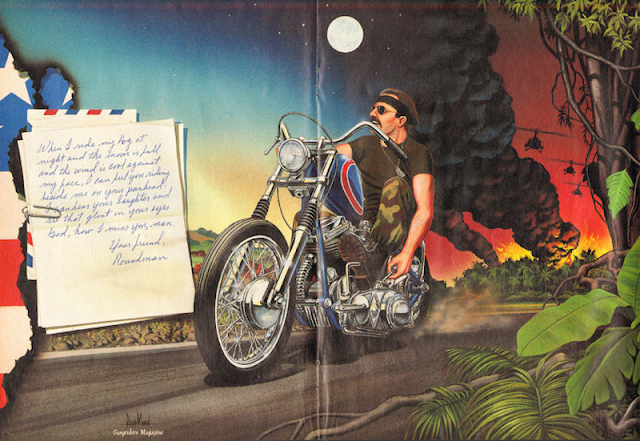 Especially anyone in the club,” says Gadsby, the Treasurer of the Army Riders of Indiana. The group has helped nearly a dozen vets this year, including the Tharps. “Oh man, it was just amazing. It took so much pressure off both of us. It was just like, wow. This is unbelievable,” says Tom. For Tom, the Army Riders fixed the plumbing and electricity, replaced the fridge, patched up and fixed the heating, and are in the process of replacing the front door. “It is not about me, it is about these guys. They are number one. They are my heroes,” says Tom. The Army Riders are looking for people who need help or people who want to help. Indianapolis, IN (December 11, 2018) — All of us have had those moments when we are not at our best, when we do something we regret. For Rebecca Mills, that moment went viral. Most people won't recognize her by name, but they probably remember the YouTube video — the one where two women traded punches at a Beech Grove Walmart. Mills, 42, is the woman in the pink shoes who got out of a scooter and wrestled with another woman in the shampoo aisle. The other woman can be heard telling a little boy to punch Mills in the face. The boy punched Mills. That’s a kind of low few people hit. And it's been viewed by millions of people since June 2015. But this story isn't about Mills' greatest embarrassments and biggest failures. This is a story about a woman who crawled from the depths of addiction and isolation with the help of allies in a special corner of the justice system. Years before she bottomed out in the shampoo aisle, Mills served nine honorable years in the Navy, from 1994-2003. She was an operations specialist, with the rank of second class petty officer. Mills served her country on three ships, including a tour in the Mediterranean. She left the Navy and stayed home to raise her three sons. After her husband retired from the Navy in 2006, they moved to Indianapolis. But things here didn't work out as Mills hoped. It was a slow descent that landed her in the legal system. Her marriage was starting to fall apart. She and her husband would divorce in 2014. "I was at complete rock bottom with no foreseen hope," Mills said. She battled depression and migraine headaches for years. She was in constant pain, and doctors couldn't tell her why. She underwent years of testing before in 2012 she was diagnosed with fibromyalgia, a nervous system disorder that causes severe body pain and fatigue. That's why she was in a scooter in that infamous video. She relied on pills for migraines, depression, and to help her sleep. Mills said they helped her avoid facing her many failures. "I became dependent on my medicine," Mills said. "I was no longer being held accountable for my life." Mills recognizes now that she was struggling with addiction. Poor choices, she said, led to that Walmart aisle. The fight earned Mills a night in jail and a misdemeanor conviction for disorderly conduct. A first-time offender, Mills was sentenced to 40 hours community service and handed a $183 fine. In the three-and-a-half years since the Walmart video went viral, it's been posted and reposted many times with added commentary and music. There's the video posted last year in which Indianapolis sports radio host Dan Dakich calls boxing match-style play by play, making fun of Mills' looks and weight. The audio comes from a segment Dakich aired on his radio show to mark the two-year anniversary of the fight. Once a proud veteran, Mills became a punchline. "I started asking myself, 'How can one be humble if they've never really truly been humiliated,'" Mills said. After the Walmart fight, Mills said she became a recluse, withdrawing from friends and loved ones. She said she was abusing her prescription pills and smoking marijuana heavily. Then, just 10 months later, things got worse. She still can't explain exactly what was going on in her head that night. She was sleep-deprived, numbed by pills and pot. She was under intense stress, she said, after the death of her dog, a break-up with her then-fiance and a suicide attempt by her son. "They could write a country song about this," Mills told IndyStar during a February 2017 interview. Late in the evening on April 17, 2016, Mills entered the south-side home of a stranger who lived not far from her. Dogs barked loudly as she tore through the home and woke the owner. She poked her head into the bedroom and said "sorry," the man told police. She took random items from the home, sunglasses, suntan lotion and a gun holster, according to a probable cause affidavit. Then she stood on the porch and screamed: "People are going to burn!" Police arrested Mills about an hour later. She asked officers to contact country singer Tim McGraw. He was her boyfriend, she told the officers, and she wanted them to tell him she was going to jail. This time Mills was facing a felony. She needed help, but she didn't realize it. "I look at getting arrested as a blessing in disguise," Mills said. "I was a sick person who needed and wanted to get well." Mills' felony case, the one where she broke into her neighbor's home and ranted about Tim McGraw, was assigned to the Indianapolis Veterans Court, a treatment program for military veterans facing misdemeanors and low-level felonies. The court helps "veterans in crisis recover their sense of mission and accomplishment," said Judge David Certo, who has presided over the court since it launched in October 2015. Modeled after the success of drugs courts, Veterans Court helps veterans and current service members grapple with the substance abuse and mental health problems that keep so many recycling through the legal system. 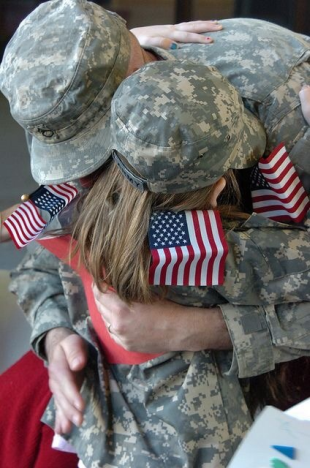 About 400,000 veterans live in Indiana, according to the U.S. Census Bureau. Many struggle with mental health issues. The suicide rate for veterans in Indiana is nearly twice the rate for Hoosiers as a whole, according to the U.S. Department of Veterans Affairs. Each week, about 25 veterans are arrested in Marion County. This year, 62 have been assigned to Veterans Court. Fifteen graduated in 2018; 16 more have graduated since the court started hearing cases. Anyone who has served in the military and has addiction or mental health problems that could benefit from treatment may be offered the opportunity to have their cases heard in Veterans Court. It's a voluntary program, Certo said. The supervision and requirements are often more intense than a sentence in the regular court system. Mills entered the program in 2016. She stood before the judge facing charges of felony residential entry and misdemeanor theft. Certo, on the bench, looked over her record of nine honorable years of Naval service and reminded Mills that she was successful once. She could be again. The court set her up with a mentor and required her to attend counseling sessions. 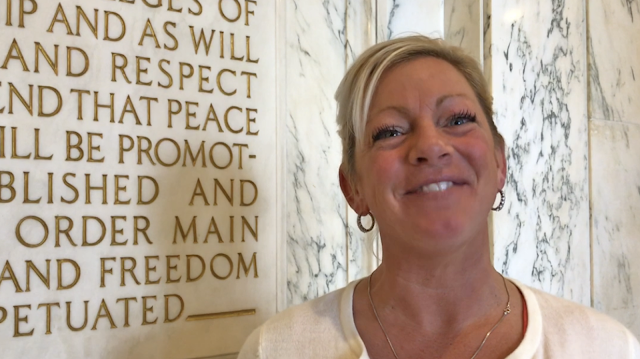 With the help of counseling and support from other veterans, Mills said she stopped abusing drugs and started going to church. Mills said she started focusing on herself and began doing what it took to straighten out. She dumped the people who supported her bad habits, replacing them with friends who wanted her to succeed. For Mills, the road back wasn't anything special. Wake up. Go to work. Get there on time. Be someone others can count on. Do it every day. Mills graduated the Veterans Court in 2017. The charges against her were dismissed — the big reward for all who complete the program. She has a job she enjoys as a field technician testing construction materials for Patriot Engineering and Environmental. She's rebuilt relationships with her three sons, one of whom now lives with her. She has put the Walmart fight in her past. It happened, but it doesn't define her. "I never thought I'd get to this point where I could talk about that and not get mad, or cry, or feel guilt or shame," Mills said. "I hope that story encourages other people to get the help they need." On Nov. 30, the court welcomed her back to its most recent graduation ceremony. This time, as the keynote speaker. 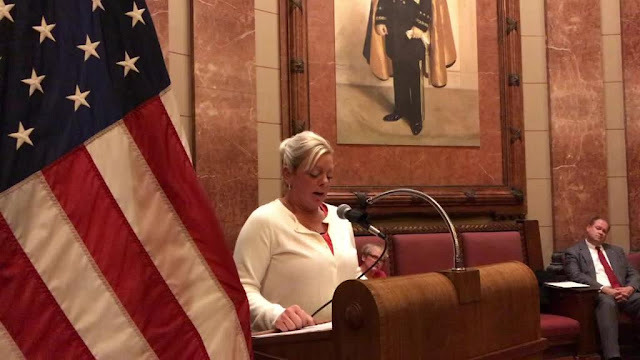 "Veterans Court was my second chance," she told an audience of more than 100 in the auditorium at the Indiana War Memorial. "It provided me with a safe, nurturing treatment program. It met me where I was and accepted me with all my flaws. "They believed in me when I didn't believe in myself." Tears ran down her cheeks as Mills finished her speech. The audience clapped and cheered, rewarding Mills with a long, enthusiastic standing ovation. 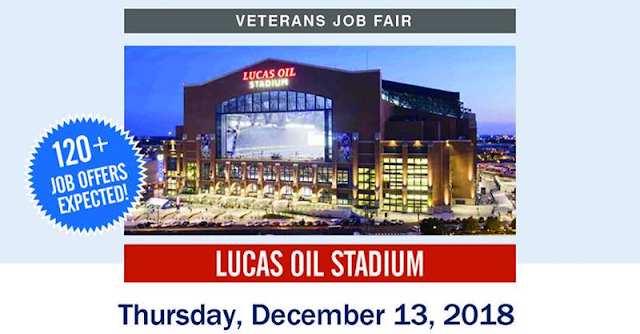 Indianapolis, IN (December 4, 2018) — Around 75 companies will be at Lucas Oil Stadium on Thursday, December 13 for a job fair for veterans. The job fair runs from 11 a.m. to 3 p.m. The 75 companies that will be at the job fair are from several different industries. Recruiters from Spectrum, Eli Lilly and Company, Farmers Insurance, Allstate and many others will be at the job fair. DAV or Disabled American Veterans and RecruitMilitary are the organizations running the job fair. They estimate the companies will have about 250 to 300 jobs to offer. The job fair is open to veterans, those transitioning out of the military, national guard and reserve members and spouses. Organizers expect about half of the people who attend to get some kind of offer or job interview. And if anything, they say it's a good opportunity for veterans to recruiters who understand how valuable veterans are. "These events are the last true place to network. We say how much networking is so important, but they really don't tell you where or how to do that. I think this is one of the last real time places that you can come and network and have a really organic conversation with a recruiter that's likely a veteran as well and if not - really understands the veteran talent space, so it's good to see even if you're gainfully employed now, it's good to see where you could go," said Chris Cravens with RecruitMilitary.